Dr. Stephen Sandler graduated from Franklin and Marshall College with a degree in English, and graduated from New York University College of Dentistry, after which he served in the United States Air Force Dental Corps. He opened this practice in 1983, and is happily married to Karen. He has two wonderful children, Ben and Elana, and is owned by a 17 lb Bichon Frise, Piper. He enjoys fishing and helping construct theater sets at a community theater in Montclair. His goal is to help each patient live longer, healthier lives. 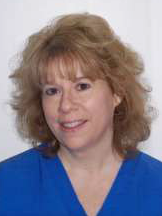 Maria has been a licensed dental hygienist in the State of New Jersey for many years now. She is committed to providing quality dental care and will always take the time to answer all your questions and address any concerns that you may have. Maria is a very warm and caring person, and she is devoted to keeping current with new dental developments and techniques by frequently attending lecture series and partaking in specialized training. Maria strives to continue to raise the bar.